I woke up this morning thinking about my experiences whitewater canoeing in Alaska and, as usual, my thoughts moved into how those experiences relate to life. Although I’ve often thought of “normal life” and the processes and stress we often go through while making decisions and getting things set up “just right” for ourselves as “paddling upstream”, I’m not sure that’s always accurate. I attended my first “poetry jam” last night. I was really impressed with the word talent displayed and the courage it takes to get up and read some of your heart’s most personal expressions in front of an audience, but was also struck by the pain and suffering revealed in many of the pieces. I’m sensing now that life might be more like hurling down a wild stretch of river with two entities in the boat that don’t communicate well. On one of my early trips, I experienced this with my then-wife…an Irish/Italian girl who had operated independently for quite some time before we became canoe partners. 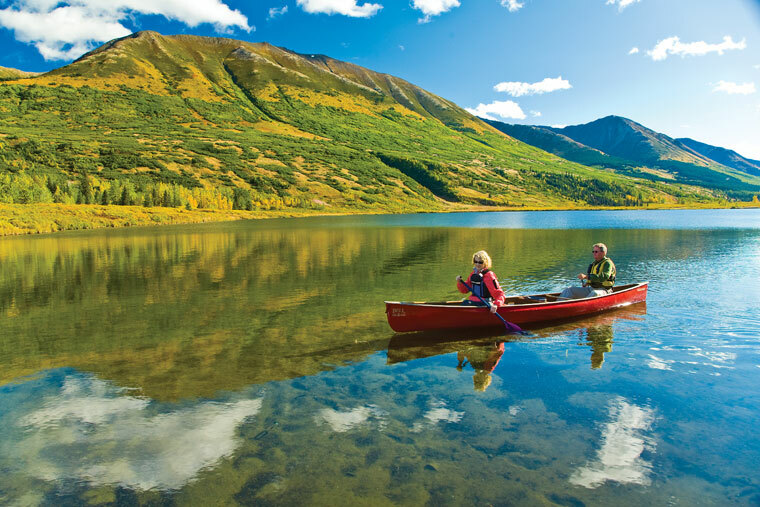 In tandem paddling, it’s common practice for the person in the stern (back of the boat) to make directional decisions and call out commands to the person in the bow. When the boat is in fast water and racing toward a rock, it’s very easy for the bow person to anticipate a command and draw left or right before a command is given. This works ok with a team that is used to paddling together and is “like-minded”, but not so well with two strong-minded people who tend to think independently! 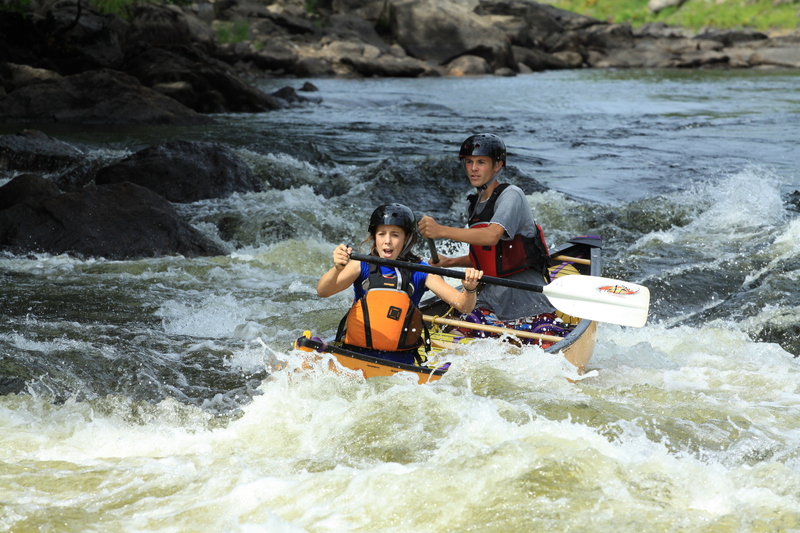 The object in whitewater canoeing is , of course, to find a safe “line” through rough waters, to negotiate the obstacles and pitfalls keeping the bow pointed roughly downstream. When the bow moves right and the stern to the left as the boat approaches a rock, the result is typically exciting; unwrapping the boat from around the rock, or worse yet, dragging the boat to shore, dumping all the water out of it and trying to dry out yourselves and all your gear however, is not….and often leads to words flying about at levels exceeding the noise of the rushing water. Otherwise-very-enjoyable trips can turn into unhappy, frustrating or even painful experiences. As we hurl along on this often-bumpy ride we call “life”, there are also two entities attempting to direct our route that don’t always communicate well—our hearts and our minds. Our minds are right in front, busily taking in all the dangers directly ahead and often reacting out of fear, not waiting for directions from our heart. The results are…well…often exciting, as we have all experienced. I don’t mean to imply that we’re all schizophrenic. Just as we are all one with everyone and everything around us, our bodies, minds and hearts (soul/Self/essential self) are also one entity….different parts of the whole. The mind, however, left to run wild, can act much like a cancer cell—also part of the body, but operating at odds with it…to the detriment of whole. It “forgets” its connection with the rest of our being, carrying on as if it were completely independent and with little or no regard for the body and the heart. Left unchecked, the mind, like a cancerous tumor, can bring an end to the whole on which it depends. Our hearts connect us to our source, and their directions are infallible…they are the perfect stern person. However, the “voices” of our hearts and bodies are very quiet–in fact don’t even use language, and it is very easy for the mind to miss their signals over the typical roar of thoughts rushing through it. Our goal in life is to first learn to hear those directions and then to faithfully follow them. If we suffer…find ourselves lodged against a rock or capsized… it is our mind that is behind it, not our heart. When we quiet the mind so that we can hear our heart’s signals…our intuitions…and we follow those directions, we begin to operate as we were designed to…one unit being carried effortlessly downstream, maneuvering flawlessly around all the rocks, sweepers and other dangers than may come along. Looking back, my former wife and I would have benefited greatly from practicing in calm waters before taking on more challenging runs. In much the same way, it is beneficial for each of us to practice listening in quietness before we enter the chaos of normal life. A quiet location is helpful, but in order to hear our heart, it is also necessary to quiet the mind. This seems at first to be an impossibility since most of us have gone our entire lives with our minds operating like independent bowmen…never realizing that, just as our electronic devices do, they have an “off switch.” Like my laptop, the mind is a tool that picks up wireless signals from outside itself, gathers information and stores it, facilitates communication and carries on many maintenance functions without me even being aware. It is an amazing tool, but it is not the whole of me….or even in charge! I also had occasion years ago to solo canoe. This requires some repositioning, but is entirely workable. Interestingly, it involves operating from the center….without a bowman. When we are “centered”, or operating from the heart with a quiet mind, it is also a “very workable” situation…often a preferable one! Without the bowman obscuring our view, we are actually more aware of what is going on around us and ahead of us. There are times and places for both methods, but whether you’re in a position to tandem paddle or solo, it’s important to practice…daily. There are many methods of quieting the mind; find one that suits you and work with it, but be patient as it takes time to overcome life-long habits! Start out somewhere quiet, hone your skills and then carry them with you when you enter faster waters. I guarantee you’ll have a much more pleasant ride!